The best brakes in the world. Period. The brakes developed at M5 are super lightweight and provide a deceleration, not matched by any other brake. How? Because our brakes have been designed with the latest methods of drawing high-tech components: Computer Aided Design (CAD). 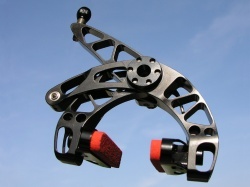 By means of extensive computer simulations, the brake has been tested on structural integrity, reliability and weight, resulting in a very revolutionary brake design. The design is cut by CNC from one chuck of aluminium. Because of this approach the brake is free from internal stresses and structural imperfections. The weight of our brakes is simply sensational: just 73 grammes per brake! Brakes from other manufacturers are twice as heavy and brake less because of the lack of rigidity of the brake arms. By now, the brakes have been available since 2005. No brake has returned for warranty! 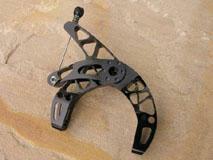 Because of the oversized design Powerarches combine an unimaginable low weight to a vast stiffness. 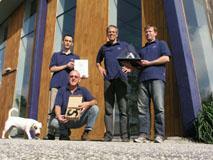 Therefore the best properties are pulled of the Space Grade material. Powerarches grap in each other, in stead of sliding along each other like at conventional brakes. The result is even more rigidity! The brake's axle is four times oversized, so the brake's attachment cannot deform. Brake shoe casings: the lightest available. A completely optimized design, weighing just 8 grammes! The stainless steel brake spring provides great operation. And never any corrosion on these jewels. Clutching of the brake cable by two allen key bolts providing easy tuning. Anodised surface: The material itself is coloured without additional weight. 4 times more rigidity than conventional brakes. After more then half a year developing and testing, M5 Recumbents presents a new extremely light-weight side pull brake with "space frame" construction. The brakes are CNC cut from 7075-T6 aluminium and "Made in Middelburg". Result is one of the most light weight brakes available in the world! Apart from that, the brake is also very stiff. During ample testing with pulling forces of 130 kilogrammes and more the brake cables ultimately broke, but the brakes didn't give in. Normally this 130 kilogrammes is never accomplished: a strong guy may pull 45 kilogrammes, but the wheel is long blocked by then. The tests proved that the axial stiffness of the brakes (the stiffness directed to the rim while pulling the brake) was 4 to 6 times (!) better than the Shimano 105, Dura Ace and Campagnolo Record brakes. The torsion stiffness when the brake makes contact with the rim was at least equal to the other tested brakes. Our products are tested in practice and have also been tested on load and fatigue, by means of computer simulations. Unique feature is the 12 mm hollow mounting axle with four bearings by which a much larger contact surface and extra rigidity is accomplished. Distinction between the rear and front brake is only the length of the M6 adjusting bolt. It's dismountable, so exchanging from front to rear is very simple. As shown on the picture the left brake arm pivots in the right arm, which also improves the construction. All other details are attended: the brake cable is tightened by means of two small M5 adjusting bolts. The brake spring is made of stainless steel and the brake itself is anodised. 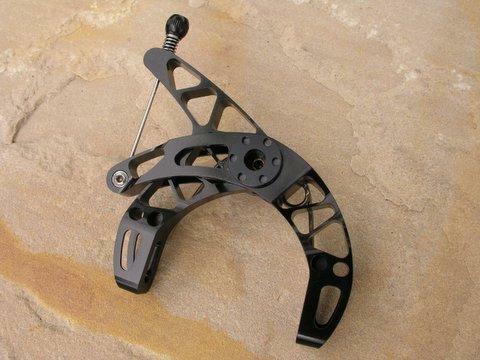 Brake range 43 - 50 mm. Hard anodised surface: the material itself is coloured without adding weight. Bearing consists of four big flange bearings of 20 mm each, great stability. Stainless steel brake spring provides great strenght. And never any corrosion on these jewels. Adjusting screws from stainless steel too. Matching brakeshoes available, varying from 19 grammes per set, to 26 grammes per set. The lightest possible brakeshoe casings imaginable. An optimized design which only weigh 8 grammes! Click to enlarge and get an overview of the finesse and the available colours of the M5 lightweight brakes. 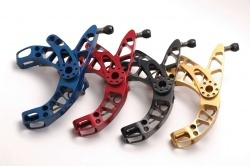 Extensive and humorous report on the light weight brakes from M5 Recumbents on Pez Cycling News, a large internetsite with news, tests and interviews on cycling. 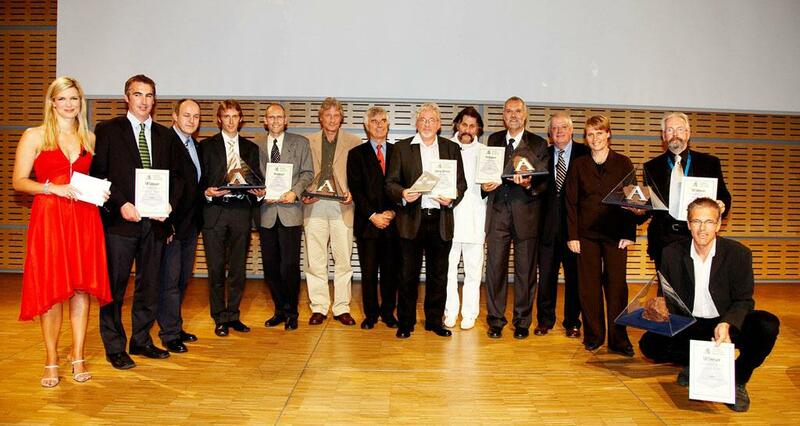 M5 Recumbents wins Aluminium Award 2006! 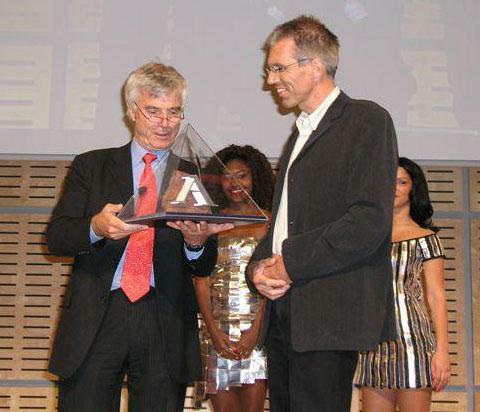 September 20 M5 Recumbents won the prestigious European Aluminium Award 2006 in the category "Innovation" in "Consumer /End products". M5 participated in this competition with the M5 light weight side pull brake, designed by Bram Moens. The brake, which is designed in Middelburg and completely manufactured in Zeeland (Netherlands) by Machinefactory Sturm in Serooskerke, can be both mounted on recumbents and conventional roadbikes. What makes this M5 side-pull brake special is the material it's made of: 7075-T6 airplane aluminium, cut according to the Finite Elements Method, which is unique in the bicycle branche. Result is not only one of the lightest brakes (just 71 gram), but by far the stiffest brake available, exceeding even large companies like Shimano or Campagnolo. 55 important names from the European industry like Audi, Porsche, Lotus, Castelli etc. were passed by the well thought and innovative M5 design. The result was that several members of the jury from industry and Technical Universities gave a unanimous vote for M5 Recumbents. 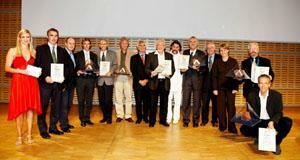 The Award Ceremony occured in Essen, Germany, attended by about one thousand invited people from the industry. The prize in the category "Innovation" was hand out by the first German astronaut Mr. Ulf Merbold. Apart from their recumbents M5 will keep concentrating on designing and manufacturing high-end lightweight bike parts. On the short term the product line will be extended with derailleurs, hubs and cranks, offering the possibility to assemble a complete roadbike with M5 parts. This will result in a considerable decrease in weight of the bike.